It sounds like all of the reasons you’ve made here for separating the mothers from their babies, Orange Patch Dairy, are really just feeble attempts to rationalize doing what you want to do with them which is making money on their milk. And you can’t make money on them without breaking up their families. The farmer goes on to describe the birthing of a new calf. The obvious difference here is that the calf will never be returned to her mother, of course, completely unlike what happens to human mothers and their newborns in a nursery setting. The farmer conveniently omitted that little bit of information. That’s ridiculous. Mammalian mothers have a natural desire to nurse and care for their young just out of the womb and into their maturity as adults. Mother cows have been known to bellow for days and weeks on end after their calves have been taken from them. Hmmm. What did these animals do before humans could “help” them nurse their babies? The fact is animals such as these cows have been nursing and raising their young just fine eons before we ever existed. They don’t need us to teach them how to raise their young. Let’s be clear. Infectious diseases are the result of commercial milk production. The problem is not the pathogens. It’s the domestication and confinement of the animals who are forced to produce milk for human consumption. By forcing them to do what does not come natural to them, they are more stressed and therefore more susceptible to infections and disease. Oh that’s interesting. So being a good mother cow does not come naturally? You forgot to mention that artificial insemination and yearly birthing does not come naturally to these animals either. What would be truly “natural” would be not to be using them at all and letting them live lives according to their own interests, not ours. If you really wanted to help them bond, there are many ways to do so. But you don’t want them to bond. You instead want to break that bond because you want the mother’s milk — the milk that was intended by nature for her calf. One million male calves are disposed of by US dairy farmers each year because they have no value to dairy farmers. It’s ironic that you should blame the mothers, essentially blame the victims, for being “bad mothers” when in fact it is us who are exploiting them. Really! Herbivores are the most gentle of all animals. The only time a cow becomes violent is when you are trying to take her babies away from her. And that’s precisely why we domesticate these animals and not hyenas, for example. They are least resistant to us. 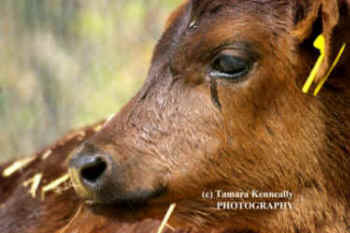 There is no future for the male calves that won’t produce milk for you. They will be either killed for veal or left to die. The only future your female cows have is the extent to which they produce milk for you. And that will end at a fraction of their natural lifespan at which time you will simply send them off to slaughter. You forgot to mention that. How can it possibly be in the interest of any animal who carries her babies for nine months to then be separated from them? It goes against everything we understand about mammalian motherhood.